Game clinching Field Goal by Stephen Gostkowski. 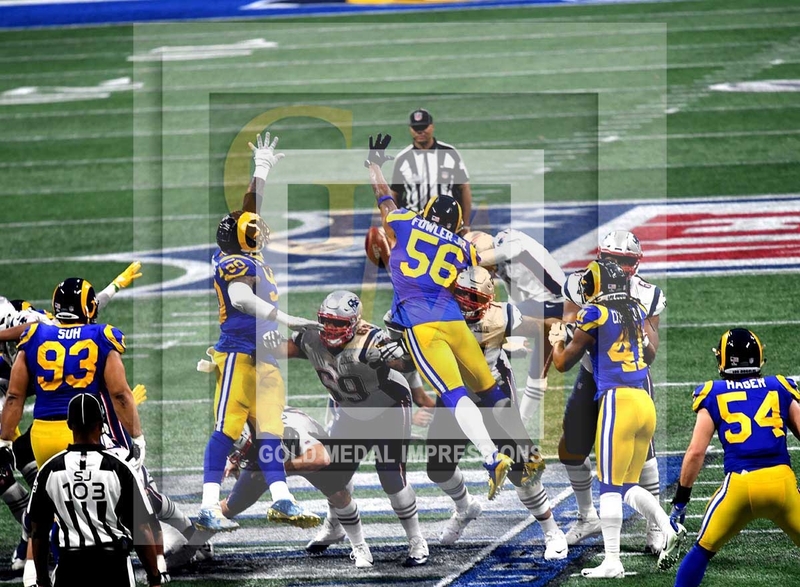 All-pro cornerback, STEPHON GILLMORE, who made the defensive play of the game by intercepting a Jared Goff pass with approximately 4 minutes left in the game, ending a serious Rams threat to tie the game; TOM BRADY, who led the team to victory and became the only player in history with 6 Super Bowl titles; JULIAN EDELMAN, who had 10 receptions for 141 yards and was selected as the game’s MVP; and finally, and perhaps most importantly, the NEW ENGLAND defense, which allowed the fewest points in a Super Bowl(tied with Dallas in 1972 against Miami. It wasn’t the offensive shootout that many were expecting, but the Patriots still managed to capture their sixth Super Bowl title with a 13-3 win over the Los Angeles Rams. 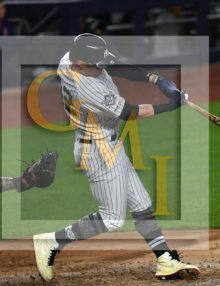 The Patriots took the lead in the fourth quarter when Sony Michel scored from two yards for a 10-3 lead. 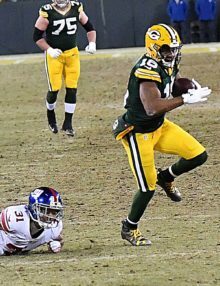 Gostkowski added a second field goal with 1:12 remaining in the game to account for the 13-3 final, the lowest scoring game in Super Bowl history. 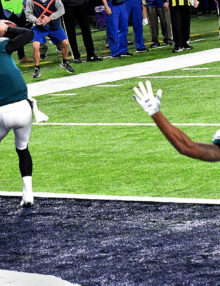 Entering Super Bowl LIII, the lowest-scoring title game in NFL history was Super Bowl VII. The Miami Dolphins defeated the Washington Redskins with a score of just 14–7. 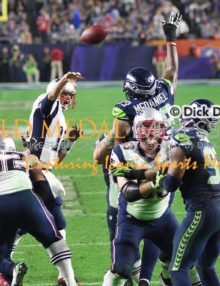 Check out these selected images from SUPER BOWL LIII, won by the New England Patriots 13-3, the lowest scoring game in Super Bowl history. 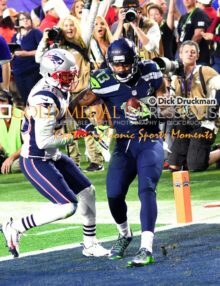 The stars of the game were New England Patriots’ running back, SONEY MICHEL, who gained 94 yards and scored the winning touchdown; the Patriots defeated the Los Angeles Rams 13-3 in the lowest scoring game in Super Bowl history. Denver Bronco’s quarterback PAYTON MANNING completes pass to CJ Anderson for a first down in the second quarter against the Carolina Panthers. 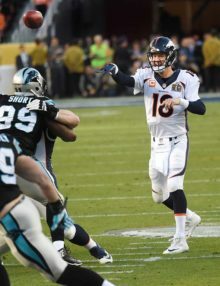 Manning led his team to a 24-10 victory capturing Super Bowl 50, thus marking Peyton Manning’s second career Super Bowl win and his 200th career win. 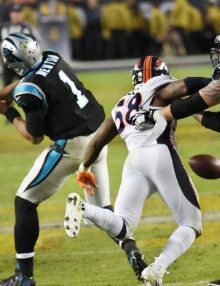 Denver Bronco’s outside Linebacker VON MILLER causes CAM NEWTON to fumble for the second time, MILLER made 6 tackles, 2 1/2 sacks, and caused 2 fumbles and was named the MVP of SUPER BOWL 50. Denver went on to win 24 – 10, capturing Super Bowl 50, thus marking Peyton Manning’s second career Super Bowl win and his 200th career win. 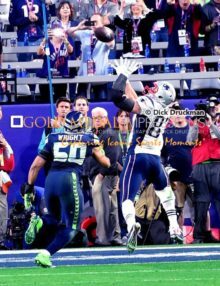 New England Patriots tight end, ROB GRONKOWSKI, catches a touchdown pass behind Seattle Seahawks linebacker KJ WRIGHT in the second quarter of Super Bowl XLIX. 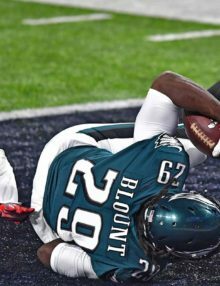 The Patriots went on to win 28-24.